The start to the Pink Lady season in South Africa’s eastern Free State has been thrilling, with producers waiting on cooler temperatures for colour development which finally came about 10 days ago and last Monday it was all hands on deck to get the apples off. Originally the start of the Free State Pink Lady harvest was pencilled in for around 20 March, but producers took the nail-biting decision to let it hang longer, after what has been an unusually hot summer. This they did for close to three weeks, fortunate to get a drop in temperatures while fruit maturity is still within specification. 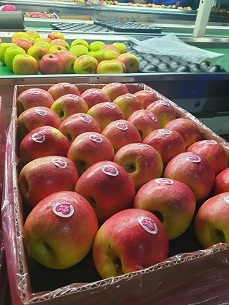 These are the very first Pink Ladies from South Africa, sent to UK retail where the pull appears undimmed by Europe’s own high apple stocks, and Free State apple producers send as much as they can during the early window. But so far it’s been a good start for the early apple producers. The domestic market was quite empty with low levels of Cripps Red roll-over stock. Royal Gala exports were focused on the East, a crescent from Dubai, through Bangladesh, to Kuala Lumpur. Maluti Fruit Packers are exporting a larger component of their harvest to clients in the Middle and Far East. Now all eyes are on Pink Lady. Hein reckons the proportion of Pink Lady to Cripps Pink to be 40:60 in their area this season. Colour came on strong during the cool autumnal weather starting last weekend and continuing, but there are incidences of defects due to cold damage during late September. Hein notes that in the UK current Pink Lady prices are about R25 (1.58 euros) per kg, 0.8 euro higher than Cripps Pink prices. 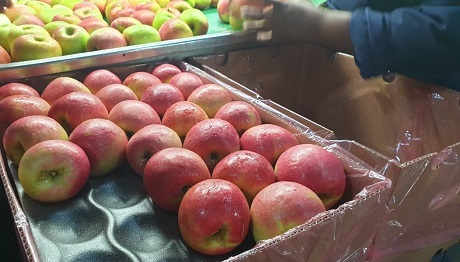 The price for Pink Lady RSA1, the standard for Africa and the Indian Ocean exports, is slightly higher than for Cripps Pink in the UK at the moment.